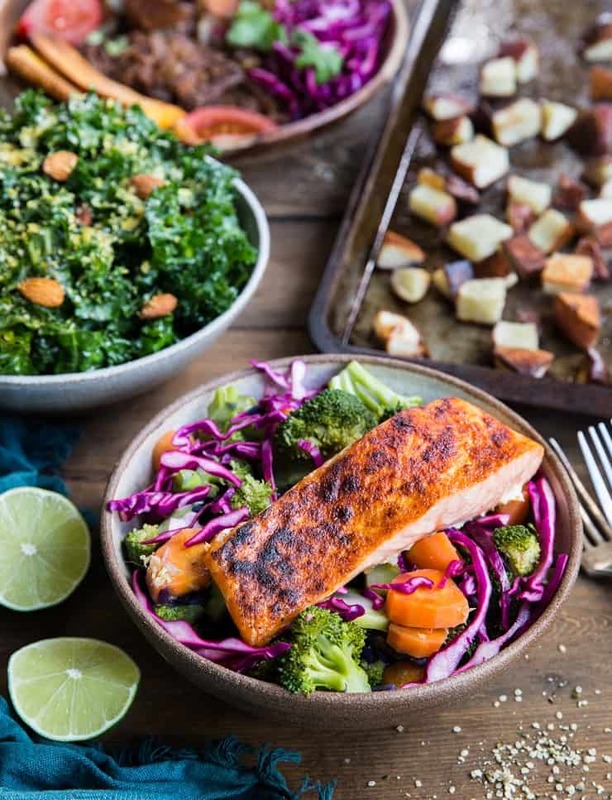 Easy oven-baked crispy salmon for a clean, nutritious dinner. This quick and simple recipe only requires about 15 minutes from start to finish! I’m a little more than half-way through my Whole30 (read all about why I’m doing a Whole30 here) and thought I’d give you all a briefing of how it’s going so far. You guys, it’s going AWESOME! It didn’t take long for me to realize my body really did just need a hiatus from all the fun…err…I mean…sugar I put into it during the holiday season. The first few days felt like small demons were wreaking havoc through my veins and neural pathways, but by day 4, I felt a renewed energy. The more time passes, the cleaner, more efficient, and all-around strong my body feels. Eating this way has also helped me regain my vision of what a mindful diet looks like. If you’ve dabbled in paleo, you know it’s easy to take a lot of liberties with grain-free flours and unrefined sweeteners. When left unchecked, the result can basically be a mirror image of a not-so-amazing diet, just with higher-quality ingredients. …Don’t get me wrong, I’m a firm believer that treating yourself occasionally is an important component of sustaining a food regimen that works long-term. It can also be easy to forget how our body works best when we’re feeling generous towards it, especially when what still feels like intuitive eating is in actuality a sugar addiction. I speak for myself when I say this, of course. 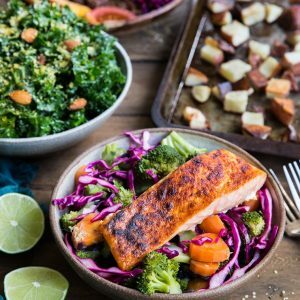 You’ve seen many-a-broiled crispy salmon recipe on this site, but often fancified and/or paired with something that requires more time and energy than I typically devote to the dish in real life. I thought I would break it on down to the basics to give you that go-to approach without any additional noise that you can come back to over and over when you’re feeling deliciously basic. Here are my easy peasy steps to making the best foolproof crispy broiled salmon that wins every dang time. Turn on the broil function of you oven (I always broil on high). Lightly oil a casserole dish or baking sheet (you can also line the dish with parchment paper or foil). Place salmon skin-down in the dish and lightly coat the flesh with olive oil (or cooking oil of choice). Sprinkle with your favorite spices (I always learn toward garlic powder, onion powder, paprika, and/or chili powder and sea salt). Note: if you follow a Low-FODMAP diet, use dried herbs like oregano and thyme instead of garlic powder and onion powder. 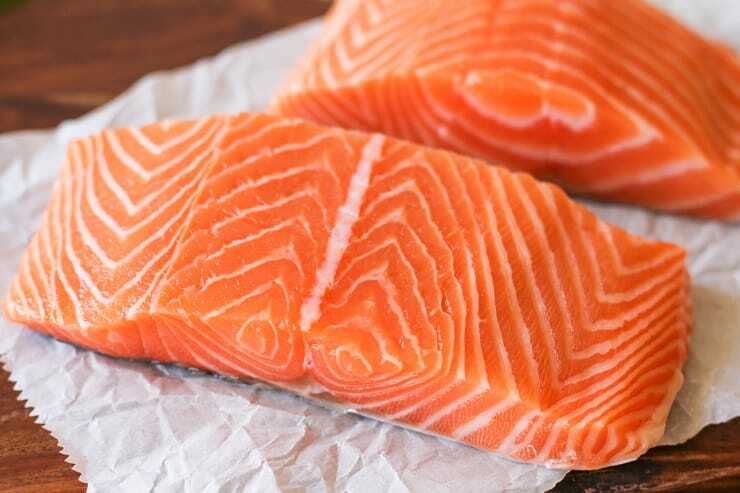 Place salmon on the second-to-top shelf in your oven and broil for 8 to 12 minutes, depending on the thickness of your salmon. 10 minutes works for me in most cases. If you like rare salmon, broil for 6 to 8 minutes. Paired with the Stir Fry Vegetables I showed you on Tuesday, this insanely simple meal is one I make more frequently than I’d like to admit. I try to add more variety to my weekly meals but I always find myself coming back to this one. Crispy salmon with stir fry or roasted vegetables. It’s too simple, too tasty, too nutritious to bypass. Plus, it’s customizable depending on the time of year – using in-season produce for the vegetable portion is brilliant. If you make Crispy Salmon, please feel free to share a photo and tag @TheRoastedRoot on Instagram! Preheat your oven on the high broil setting. Lightly oil the bottom of a casserole dish and place the salmon fillet in it. Drizzle olive oil over the flesh of the salmon and use your hands to spread it over the full surface so that everything is coated. Sprinkle with sea salt. In a small bowl, combine the paprika, garlic powder, onion powder, and coriander. Sprinkle this mixture liberally over the salmon (note: you may have leftover seasoning, and that's fine! You can use it for future salmon/chicken/steak endeavors or on vegetables). Place the salmon on the second-to-the-top shelf of the oven and broil for 10 minutes. (6 minutes for rare salmon, and up to 15 minutes for a very thick cut of salmon). 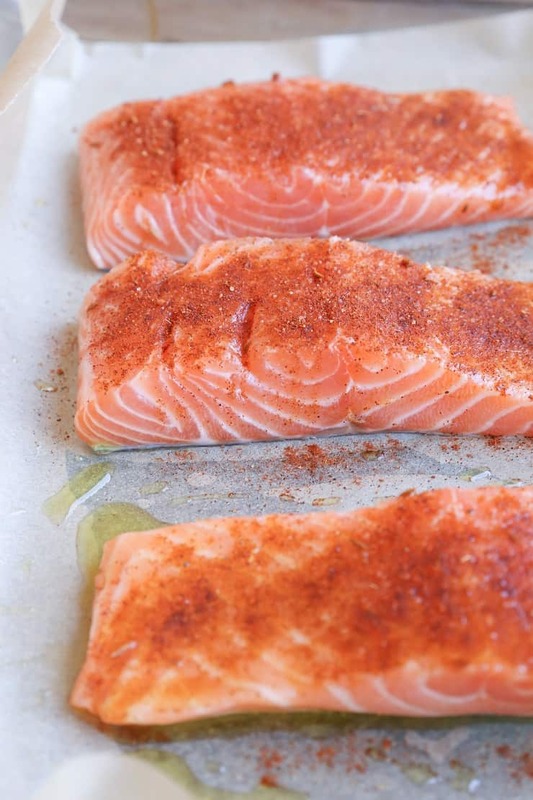 Remove from the oven and allow salmon to cool 5 minutes before serving with your favorite side dishes. If you follow a Low-FODMAP diet, replace the onion powder and garlic powder with dried oregano and thyme. Great photo, the salmon looks moist and delicious. Makes me want to broil salmon tonight for dinner! Love this! I usually make my crispy salmon on the stovetop, but can’t wait to make this hands-off version. Beautiful photos, too! Yaaaas! Let me know how you like it! Thanks so much for including a low FODMAP variation—I’ve included a link to the recipe in this week’s #FODMAPfriday round-up. Looks so tasty! I’m thinking of some salmon recipe these days. This one looks easy and healthy which is surely my future choice! How does the skin get crispy if it is skin side down away from the broiler? Or does the top of the salmon get crispy?